Watch a client’s testimonial on how we recovered $200,000 for his family. 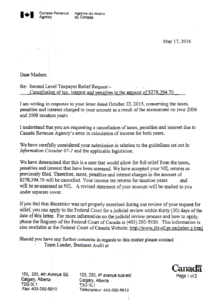 “I am writing in response to your letter dated October 22 2015, concerning the taxes penalties and interest charged to your account as a result of the assessment on your 2006 and 2008 taxation years. This letter refers to your June 20, 2017 Notice of Objection to the Foods and Services Tax / Harmonized Sales Tax assessment #4434781 dated June 14, 2017. After 10 plus years of not paying income tax, due to a snowball effect of one life event after another, I could no longer take the stress of looking over my shoulder wondering if and when the CRA would finally “get me”. For years I wanted to come clean but my fear of the CRA and my lack of knowledge as to how to even approach them, held me back. I feared going to jail. Then I was lucky enough to stumble across Cawston and Associates. Not only are they very knowledgeable in everything to do with the CRA and situations like mine, they are also really great people. They were not judgmental and they protected me like I was a member of their family. At no point did I have to deal with the CRA personally. Cawston handled everything for me and explained every option and outcome in detail. Although the outcome of my financial situation wasn’t a bed of roses, it certainly wasn’t as horrible as I thought it would be. The stress and years of sleepless nights disappeared after my first meeting with them. I would highly recommend them to anyone who is in a similar situation to mine or has any issues with the CRA. I cannot say enough about how professional, knowledgeable, kind and caring they are. I owe them everything because they gave me my life back! If you are faced with the daunting task of resolving a tax problem with the CRA, I strongly recommended Cawston and Associates. In my opinion, Bill and Wendy Cawston are the embodiment of decency and diligence. They are ready and willing to stand up for the little guy. When I explained my tax problem to them, Bill and Wendy listened attentively, recognized immediately that the CRA was clearly in the wrong, and set about rectifying the problem methodically and with confidence. Bill’s intimate knowledge of the tax code combined with his keen understanding of CRA rules were a welcome relief to me during my struggle. He cut through the maze of incomprehensible regulations by providing sensible, clear-headed explanations. At a time when I felt like nobody else understood my deepest concerns, Wendy and Bill’s tenacious effort to right a wrong reinforced my faith that everything would turn out right for me. In the many months that followed, whenever I had any misgivings about how my case was going, Bill and Wendy were quick to reassure me. Cawston and Associates was clearly in it for the long haul and Bill and Wendy both stressed the need for patience. Their moral support at a very difficult time was what meant the most to me. When Bill and Wendy had relevant information to share with me regarding the progress of my case, they returned my phone calls promptly and updated me thoroughly. Wendy and Bill both understood what I was going through. I slept better at night and was able to go the full distance with the government bureaucracy because I knew that Cawston and Associates was on my side and willing to see my case through to the end. It is my absolute pleasure to recommend Cawston & Associates Inc. should you require personalized tax advice. Throughout the process of voluntary disclosure, they set my mind at ease with their intimate knowledge of the process and an understanding of my fears. They worked hard at minimizing my tax exposure with more than excellent results. They were able to achieve, on my behalf, a rebate. To Bill and Wendy Cawston, thank you for your understanding, hard work and dedication. It was a pleasure doing business with you. We first met Bill after having endured a grueling year’s audit by the CRA, during which time we were emotionally mistreated and harassed by the auditor, who claimed to be our “friend”. We were at our wits end, clinically depressed, and considering bankruptcy, even though we believed the results of the audit were punitive and unfair. In fact, it was during a meeting at a bankruptcy trustees office that we first heard of Bill, and the services he provided. Therefore, as an alternative to bankruptcy, we went to see Bill. This is the best thing that we ever did! Upon describing our situation to him, he immediately put our minds at ease by explaining what he could do for us, what the process would be, and how long it would probably take. He also went through our files and told us what other information and documents we would need to get to him. We did this, and Bill took over everything, as well as arranging for psychological counseling that we needed, both on a personal level, and for the purpose of taxpayer relief. Because of his background at CRA, where we understand that he fulfilled many varying responsibilities, and used to have a very high managerial position, he has all the right contacts, as well as the goodwill, to deal directly with the highest managers and officials, people that we could never have known about, reached, or spoken to. Unless Bill is working for you, you would never know about these people, or have the opportunity to speak to them. In addition, all necessary paperwork, meetings, and discussions, were handled by Bill, in a competent, efficient, and professional manner. At all times we were informed of his actions on our behalf, including taxpayer appeals, that were being undertaken by him. In the end, the results and findings of the auditor were completely reversed, in their entirety. We completely won on all parts of our appeal, and the cheque that we had earlier sent to CRA was returned to us, with interest! 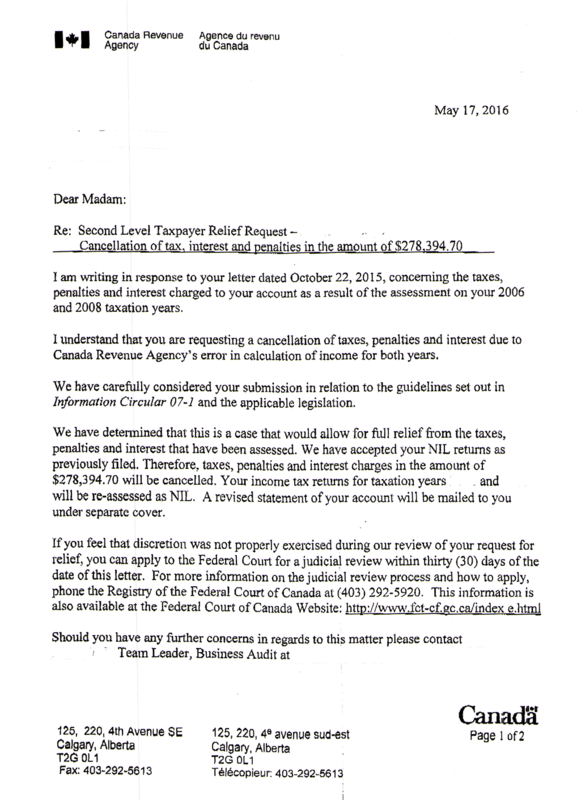 Then, a few months later, CRA again sent us a huge bill on re-audit of another tax year. We had Bill take this matter over as well, and once again, he was able to have this bill cancelled in its entirely, due to a mistake by CRA, but one that we would never have known about on our own. Thats twice he has made a huge difference for the better in our income tax affairs. Thank you Bill for all the work and effort you have done for us in our dealings with CRA! You have the background, knowledge, motivation, and experience to do what you do, and we encourage others needing help with their income tax problems to call you. Like us, they will be glad that they do. They say in life there are two things you can’t avoid. One is death and the other is taxes. Well, they’re right. 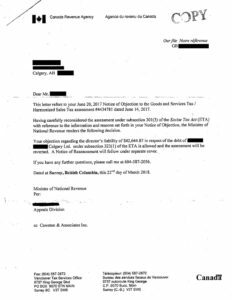 Five months after my husband tragically passed, Revenue Canada called me saying I owed them $493,000.00 in taxes owing from a Flow-Through Share program that didn’t qualify as a tax shelter almost 7 years prior. “When can you come into our office and we can set up a payment plan?” he asked. Absolutely stunned at the information I was receiving, still reeling from my husband’s death and all other legal matters, I said I’d have to contact my lawyer. Truth is, I didn’t have one who dealt in these issues. A few weeks later, from ‘six degrees of separation’, I met Bill Cawston. I was completely intimidated by this tall, robust gentleman, who at one time worked with Revenue Canada, and was highly positioned within its department. A Level 5 or something similar, enough to make me confess every wrong doing I’d done over the years, want to produce every receipt I never submitted and all the incidentals I’d never claimed. Very quickly, through our conversation, it was obvious he was there to help, knew of my dilemma and what course to pursue. Bill is extremely thorough, highly intelligent and while respecting those who work “on the other side!!! !” of the tax department, he remains connected with many individuals on a first name basis. He knows what questions to ask of you, what documents Revenue Canada will require, and in turn acts as your representative when facing those you feel won’t settle for anything less than every dollar you own. I couldn’t do anything but trust him and to this day, I don’t know what I’d have done or where I’d be right now if it wasn’t for Bill. And this problem didn’t occur with me just once, it happened twice, both times with positive results. I can’t say enough about this blunt, yet Gentle Giant, and it has been my pleasure referring him to many others who feel they can’t see through their financial difficulty. Remember his number, it’s 403-251-5925. Kind of like your doctor, you might need his number some day…just in case. Thanks again for the relatively painless process to reach such a positive outcome for my father’s estate regarding his 2004 reassessment. Your excellent knowledge of tax law and Revenue Canada procedures kept everything very simple and straight forward. I will be recommending you to anyone I hear of with a dispute with Revenue Canada.